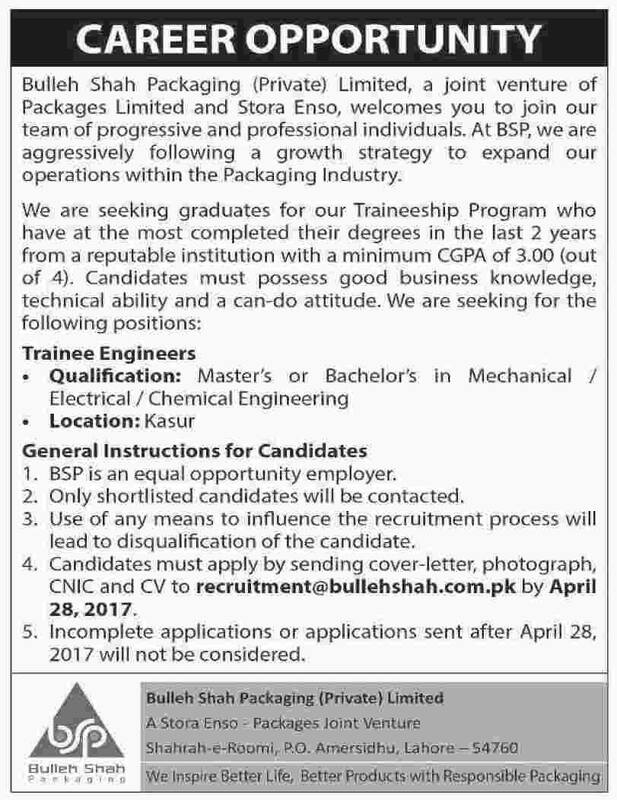 Bulleh Shah Packaging Private Limited, a joint venture of Packages Limited and Stora Enso, welcomes you to join our team of progressive and professional individuals. At BSP, we are aggressively following a growth strategy to expand our operations within Packaging Industry. We are seeking graduates for our Traineeship Program who have at the most completed their in the last two years from reputable institution with a minimum CGPA of 3.00 / 4.00. Candidates must posses good business knowledge and a can-do attitude. We are seeking for the following positions. Master's or Bachelor's in Electrical, Mechanical, Chemical Engineering from a recognized university.